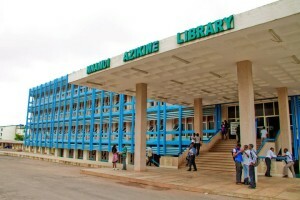 The University of Nigeria, Nsukka (UNN) was established by the Federal Government of Nigeria in 1955. UNN is the first indigenous university in Nigeria located in Nsukka, Enugu State, Eastern region of Nigeria. Modelled upon the American educational system, UNN is the first self–governing university in Nigeria. With over 20,000 students, the University remains one of the few institutions in Africa that offers research and courses in Astronomy at both undergraduate and postgraduate levels. Under the administration of current Vice Chancellor Professor Benjamin C. Ozumba, UNN has been accredited as an ‘A list’ university in Nigeria. UNN is affiliated with the Institute of African Studies; Institute of Education; Institute of Developmental Studies; Council for Regulation of Engineering in Nigeria (COREN); and the Association of African Universities (AAU). UNN is was also the first land grant university in Africa. UNN has a great number of notable nominees, some of which include the Vice-President and Treasurer of World Bank, Arunma Oteh; Governor of the Central Bank of Nigeria, Godwin Emefiele; Former Vice-President of the World Bank, Obiageli Ezekwesili and many other dignitaries.